Enhance any activity by listening to music with these Alphagear M7 Bluetooth 4.1 Wireless Stereo Headphones. They’re equipped with CSR4.1 8645 Bluetooth stereo chips and feature aptX technology, making them suitable for use with Android smartphones, tablets and Bluetooth-compatible devices. You can wirelessly connect to your device and enjoy high-fidelity, stereo music as well as clearer speech when you're on a call. Integrated multi-point technology allows you to connect to two devices at once, letting you seamlessly switch between two phones, or your cell and listening device with the simple touch of a button. Providing a secure, comfortable fit, you can use these headphones while working out, cycling, jogging, hiking or exercising. The headphones comfortably lift the cord off your neck and come with three alternative ear hooks to provide a perfect, secure fit for every user. This provides you with a liberating workout experience no matter what you’re engaged in. For added convenience, the headphones are equipped with signal enhance technology so you don’t lose your signal in the middle of your favorite tune. Store the device in your pocket, bag or desk drawer and enjoy your music without annoying signal droppage. You’ll never have to skip a beat again. These headphones make a great gift for any music lover or fitness enthusiast on any special occasion. Listening to music will intensify any workout experience, plus make is more enjoyable to boot. 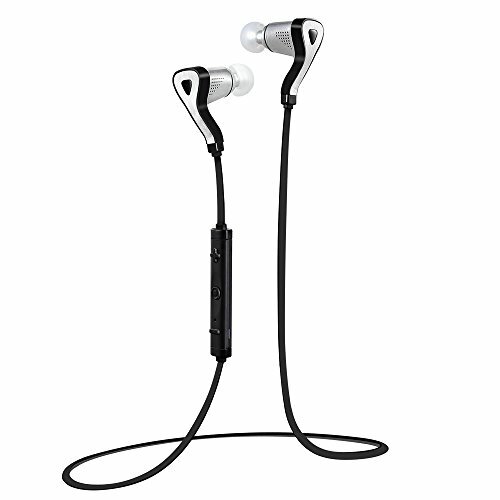 These professional, sports earphones are also ideal when engaged in household chores, computer work or simply lounging out. Enjoy high-quality sound anytime, anywhere with Alphagear. HIGH-QUALITY SOUND. Equipped with CSR4.1 8645 Bluetooth stereo chips and boasting aptX technology, these headphones allow you to wirelessly connect to your device while delivering high-fidelity, stereo music. Additionally, it provides clearer speech when you're on a call. SIGNAL ENHANCE TECHNOLOGY. Don't lose your signal when you're engaged in your favorite activity. Equipped with signal enhance technology, you can store your device in your pocket, bag or desk drawer and still enjoy your favorite music without having to worry about the signal being dropped. INTEGRATED MULTI-POINT TECHNOLOGY. You can conveniently connect to two devices at once with integrated multi-point technology. Seamlessly switch between your business and personal phones, or your cell and listening device so you can always stay plugged in. COMFORTABLE, SECURE FIT. Lightweight and sleek, the headphones comfortably lift the cord off your neck. Furthermore, they come complete with three alternative ear hooks to provide a secure fit along with a liberating workout experience no matter what you're doing. VERSATILE USE. Compatible with Apple and Andriod smartphones, tablets and other Bluetooth-enabled devices, you can enjoy your favorite tunes when working out at the gym, jogging around town, hiking your favorite trail or during an exercise class. They're also great when engaged in housework or taking a break from your busy work day. If you have any questions about this product by Alphagear, contact us by completing and submitting the form below. If you are looking for a specif part number, please include it with your message.